Solar Lanterns are solar powered portable lamps, which are ideal sources of light, both as an emergency lamp and a regular light in areas with irregular or no grid power. The Solar Lanterns are powered by solar modules, which convert sunlight into electricity by charging the battery in the lantern during the day. This stored electricity of Solar Lanterns is used during the night to provide light for 3-4 hours. 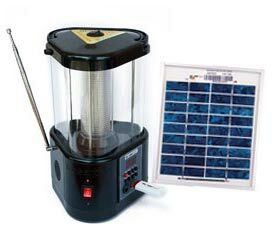 Avail precision engineered Solar Lanterns from us at very reasonable prices.